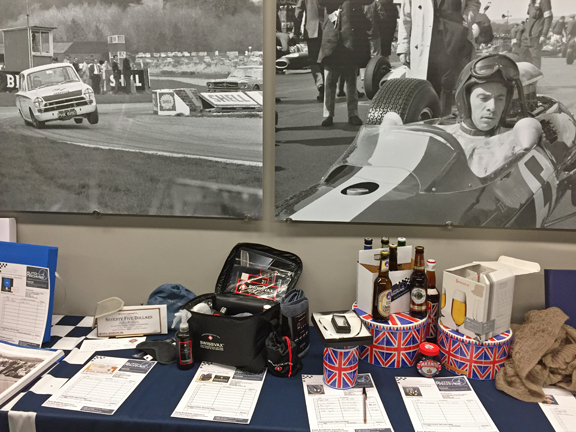 On 9th of September Auto-Archives held an exclusive fund-raising event that celebrated the Goodwood Revival Meeting which tooking place the same day in the UK. 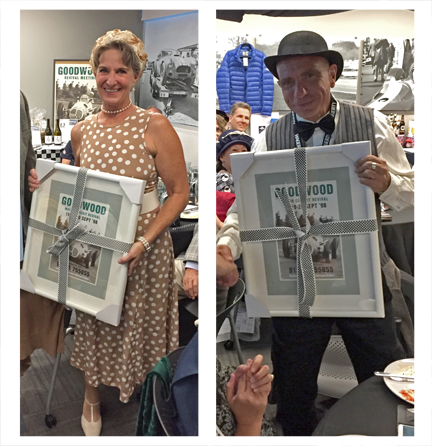 This very special fund-raising event, an evening of fun and entertainment titled “Goodwood in Golden.” was the first of what will be an annual gathering. 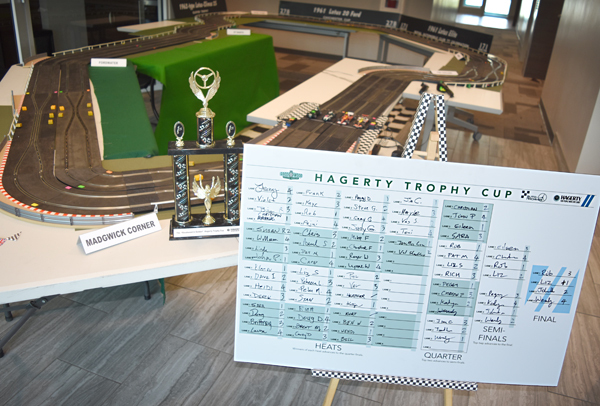 The event at the Hagerty showroom in Golden, from 5:00-9:00pm, had plenty of action with Slot-Car Racing (with prizes) on a replica Goodwood Circuit, Live Streaming (in delay) of the Goodwood Revival Meeting races, a Silent Auction, Car of the day Competition, Best Dressed Guests, Racing Displays & Decor. There was of course also good British food (Fish & Chips and Bangers & Mash), and drinks (Beers, Fine Wines (well maybe not British!) & Soft Drinks) were served. This exclusive event was limited to just 75 guests and two lucky guests won a year membership as a ‘Fellow’ of the Goodwood Road Racing Club. This new GRRC Membership was announced just a month ago. Dress Code for ‘Goodwood in Golden’ was as for the Revival Meeting – Period Clothing – Pitlane, Paddock & Party Attire and all the guests dress appropriately. Val Carney took the prize for “Best Dressed Lady” and Chris Beuhler who looked rather dapper in his waistcoat and bowler hat the Best Dressed Gentleman. The selection of Collector Cars for the informal Car Show was pretty impressive, and the “Car of the Day” award went to the 1929 Rolls Royce of Kurt Furger. 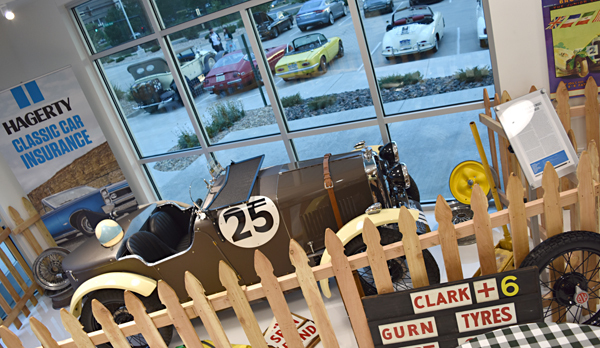 Tickets which were only available in advance by a donation to the Auto-Archives 501c3 non-profit were sold out pretty quickly and many of the guests have already booked for next year! Additional donations to the archive were gladly accepted, and the event was a great success and at the end of the evening over $3000 had been raised for the Archive. Thank you to all those who joined us on Saturday night for our first “Goodwood in Golden” Goodwood Revival Celebration Meeting. We hope that you enjoyed the evening and all it’s festivities. We would like to thank Lord March at Goodwood for sending over his welcome video supporting our event. We are pleased and honoured to be working with Goodwood and the GRRC (Goodwood Road Racing Club) to help promote the newly announced ‘Fellowship’ membership of the club, of which we gave two memberships away on Saturday. We would also like to thank Jack Kahler for lending us his superb MG Double Twelve which was on display in our ‘Goodwood Paddock’ display and Peter Darley for letting us display his terrific period images from Goodwood around the building. 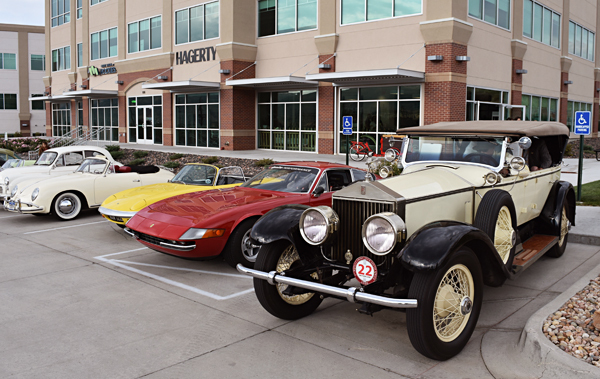 We were fortunate to receive donations from local businesses; Bonefish Grill, Carrabba’s, Ferrari of Denver, Coterie Press, Table Mountain Inn, La Encantada Estates, Wine Country Motorsports, 5280 Magazine, DiningOut Magazine, Les Schwab Tires, Diecasm, Classic Team Lotus, Swissvax, Applejack and Advance Auto Parts. When you frequent these businesses, please be sure to mention that you saw them at Auto-Archives.